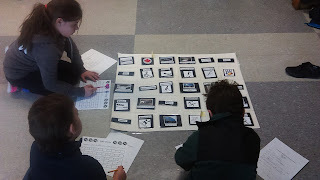 The Winter Olympics was a great opportunity to incorporate a fun and engaging coding activity. Students selected a Canadian Olympian and completed a research activity (identifying their province, event, Olympic venue and results). Using this information, students wrote lines of code in order to move the Beebot to the various locations on the grid. When preparing for this task, I created a master copy of the selected athletes and their information so I could verify student answers. I created the grid and laminated it then adhered velcro tabs. My thinking was this would make it easier to vary the grid and change it up for each group of students. It also allowed me to include more Canadian athletes so everyone had their own athlete. This was important as throughout this activity, students shared their research information with their peers as they were now the "expert". **Now, as much as this velcro idea sounds great, when I tested it with my beautifully laminated cards, the Beebot got stuck! I tried taping each card down but it still wasn't working as intended. So, the solution.....PLEXIGLASS! This was AWESOME! The plexiglass gives a smooth surface and can be placed over any grid and used over and over again.